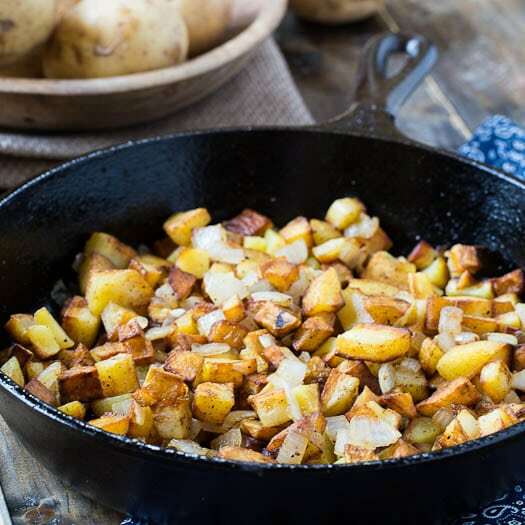 These Duck Fat Home Fries are made from Yukon gold potatoes that are pan-fried in duck fat until brown and crispy. A little onion and a few seasonings give all the extra flavor needed. So easy. So delicious. Cooking potatoes in duck fat transforms them from something ordinary to something extraordinary. I had been wanting to cook potatoes in duck fat since falling in love with the French fries cooked in duck fat at Tatooed Moose in Charleston. But duck fat isn’t necessarily easy to find. I had heard that Whole Foods carries it, but I didn’t have any luck finding it there. I finally found some at Reid’s Fine Foods in Charlotte. And it was fresh duck fat, sold by the pound. A little on the pricy side at about $10 a pound, but it turns out that was a great price compared to online resources. An 11 ounce jar from Williams Sonoma will set you back $14.95. You can get Duck Fat slightly cheaper on Amazon. I only bought half a pound and was able to make a huge batch of home fries with half of it. Duck fat feels and looks a lot like vegetable shortening. Apparently it is wonderful when used in pie crusts but I haven’t tried that yet. Duck fat is high in monosaturated fats and has less saturated fat than butter. It has a smooth texture, a mild but distinct flavor, and a high smoking point, making it suitable for everything from baked goods to roasting and frying. To get nicely browned potatoes, there’s no better way than using a cast iron pan. If you don’t have one, they are a wonderful investment. You can often find old ones at flea markets or you can buy a new 12-inch Pre-Seasoned Skillet on amazon for a reasonable price. They will last many generations and can be used to cook just about anything. While the potatoes are cooking, don’t move them around too much. Let them get nice and brown on one side before flipping them. 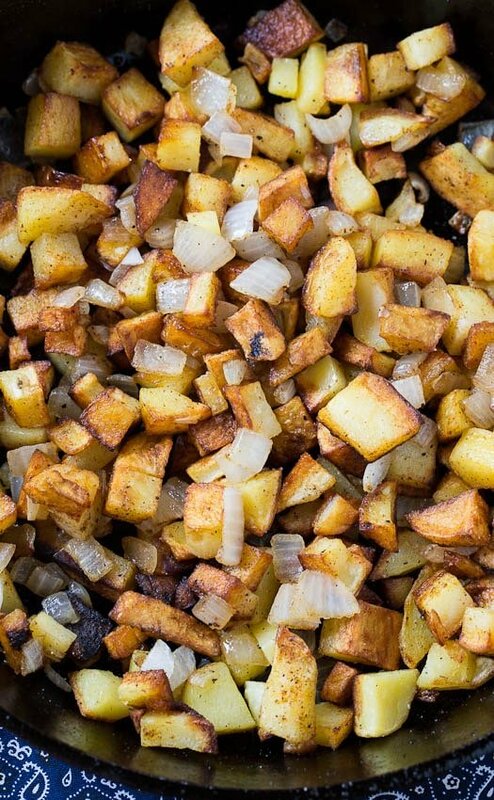 Add a little onion, salt and pepper, and maybe a few seasonings, and you have perfect home fries for breakfast, lunch, or dinner. Or all three! Yukon gold potatoes pan-fried in duck fat until crispy and insanely delicious. Melt the duck fat in a large skillet (cast iron works best). Add the potatoes in a single layer if possible. Cook for 5 minutes. Use a spatula to flip potatoes over to an unbrowned side. Cook 5 minutes. Flip the potatoes again and add onion and seasonings. Cook 3 minutes. Turn potatoes one more time and cook until soft. This entry was posted in Side Dishes and tagged duck fat, potatoes. Bookmark the permalink. Had some trouble finding duck fat but it really makes these potatoes taste incredible! Duck fat fries definitely are worth the potential clogged arteries.. I need to make the recipe, I can imagine how delicious they taste! Wow- I’ve only had duck fat fried items at restaurants, I never knew you could actually buy duck fat in a store or online. Amazon here I come…thanks for the info! Oh boy…potatoes are so good but I bet it is incredible with the duck fat! I remember seeing duck fat sold somewhere around me…now I am really trying to remember! I like making home fries for weekend breakfasts. This version would be such a treat! Ok so I have never heard of duck fat before so please forgive me for these “duh” questions – but, is duck fat from ducks? And is it gamey tasting at all? I am totally intrigued now…and btw, your potatoes are making me hungry! Oh, Christin, I used to cook with duck fat. It’s so flavorful! I think we might’ve ordered it from D’Artagnan – which is an amazing store in NYC! Ohh this is so interesting! My husband is a big duck hunter so I cook duck often, but I haven’t ever used duck fat. These potatoes look just perfect! My weakness for anything with home fries and duck fat has now intensified. This will be made! Home fries are one of my favorite kinds of potatoes! And what a great idea to cook them in duck fat. Sounds like it gives it so much flavor! These look delish! You know duck fat is the stuff when Whole Foods carries it in the meat department ! While I don’t care for duck, the fat is a complete luxury, just as you’ve described it. 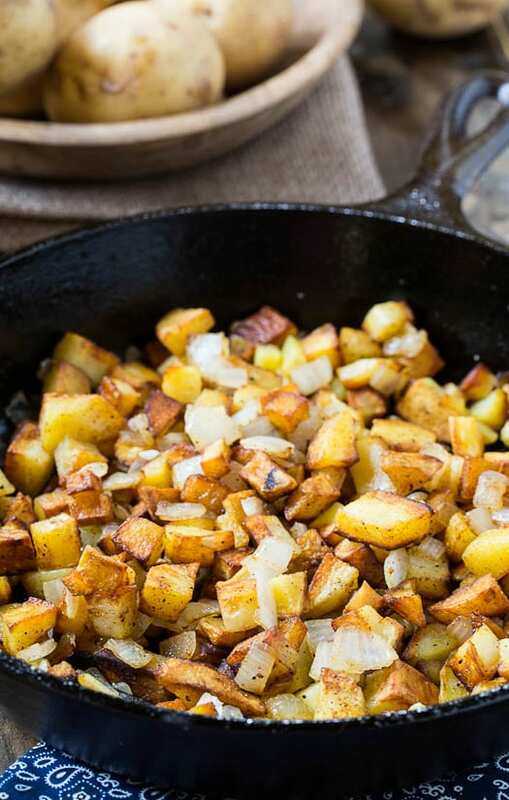 These home fries look amazing! I’ve had duck before and loved it, but never tried cooking anything in duck fat. I’m sure it makes these fries insanely delicious though! I need to keep an eye out for some though, I’m sure I could find some good uses for it. Including these home fries! 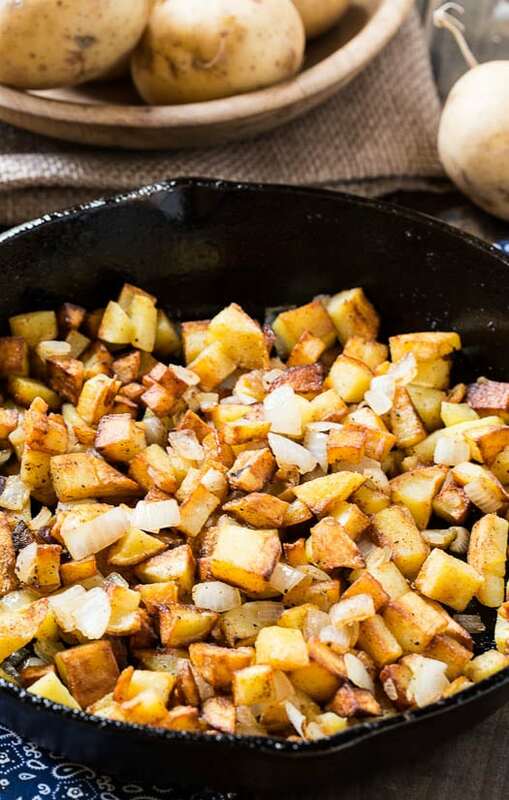 These home fries look perfect! I’ve had french fries cooked in duck fat before. Mighty tasty, really great flavor. I’m going to be on the lookout for some duck fat the next time I’m at whole foods.